Indian Natural Fancy Color Diamond & Jewellery manufacturer of india Pink Diamond Blue Diamond Black Diamond Yellow Diamond White Diamond Gray Diamond Milky Diamonds natural canary yellow diamond hongkong diamond manufacturer hongkong diamond supplier hongkong diamond exporter new york diamond manufacturer - Indian Rose Cut Diamond manufacture We carry Largest collection of Rose Cut Diamonds - Dom cut Rose Cut Diamonds White Colorless Rose Cut Diamonds VVS-VS-SI Clarity, Color E,F,G,I,J, In colours Rose Cut Diamonds we carry Brown, Pink, Yellow, Golden, Champagme, Green, Black & Gray Rose Cut Diamonds. In colours Rose Cut Diamonds we carry Brown, Pink, Yellow, Golden, Champagme, Green, Black & Gray Rose Cut Diamonds. Diamond cut rose cut diamond also called old style cut diamond. A Dom cut Rose diamond cut is a style or design guide used when shaping a diamond for polishing such as the brilliant cut. Cut does not refer to shape ( pear, oval & round ), but the symmetry, proportioning and polish of a diamond. The cut of a diamond greatly impacts a diamond's brilliance; this means if it is cut poorly. Rose cuts are seldom seen nowadays, except in antique jewelry. Like the older style brilliants and step cuts, there is a growing demand for rose cuts for the purpose of repairing or reproducing antique pieces. we cutting and polishing various colors rose cut diamonds as a color white diamond in rose cut, color brown in rose cut shape diamond, color champagne diamond in rose cut diamond, color grey diamond in rose cut diamond, color pink diamond rose cut ( pink diamond rose cut we sale also ), blue color diamond rose cut. we polishing poor quality to high quality rose cut diamond mm size also. White Dom-Cut Rose Cut Diamonds 27carat parcel, G / VS-SI1, Size 2.5mm to 4mm, Cutting Polishing VG. Please email for Price. Image Available. 5MM White Colorless Dom Rose Cut Diamond Color E, Clarity VVS1, Shape Round, Cutting polishing EX, Please email for price. 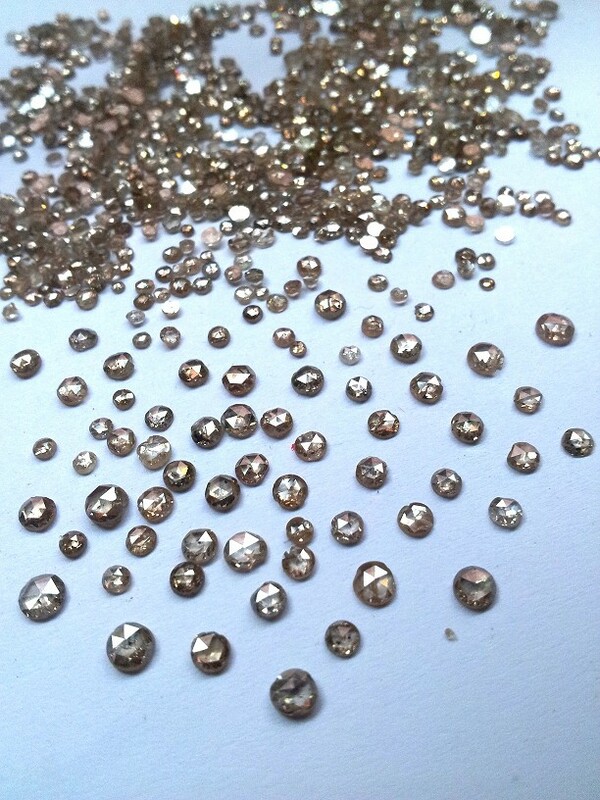 Commercial quality Indian rose cut diamonds brown color, Size availabe 2mm to 5carat, called also old cut diamonds. This rose cut quality use in silver jewelry. 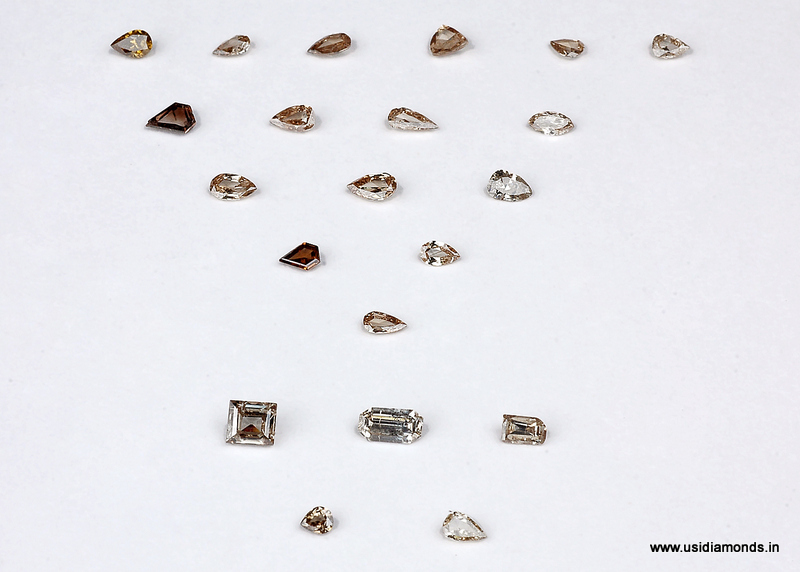 Brown Rose cut Diamonds stones in fancy shapes.